Why not make your own to take with you to your baseball tailgate? Preheat oven to 300 degrees. Butter a large rimmed baking sheet; set aside. 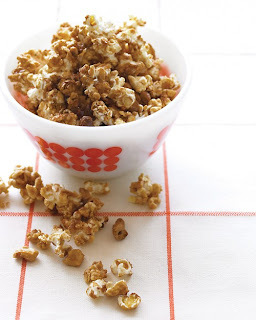 Place popcorn in a large bowl; if using cashews, add to bowl and toss to combine. Set aside. In a small saucepan, bring butter, sugar, 1/8 teaspoon salt, and 2 tablespoons water to a boil, stirring constantly. Working quickly, drizzle popcorn with sugar syrup, and toss. Spread popcorn evenly on prepared baking sheet. Bake, tossing occasionally, until golden and shiny, about 40 minutes. Transfer hot popcorn to parchment-paper-lined baking sheet; let cool. **Store in airtight container up to 1 week.